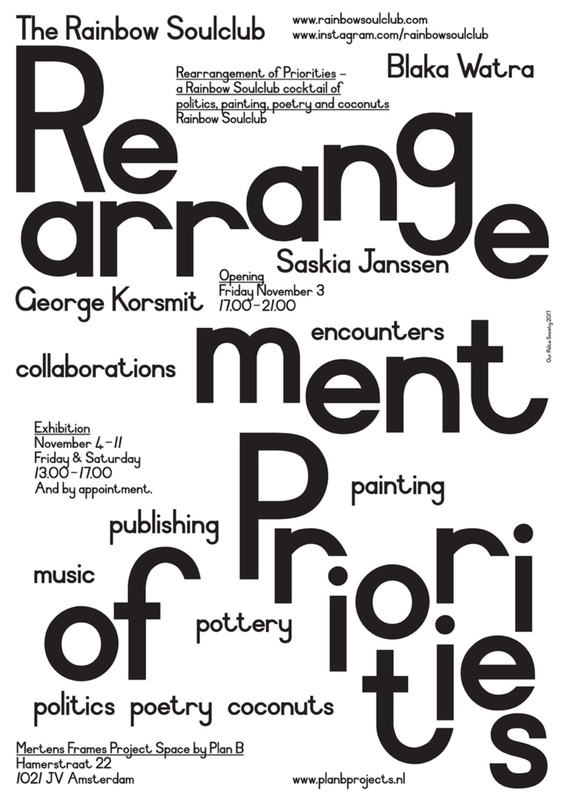 Rearrangement of Priorities Saskia Janssen, George Korsmit & Rainbow Soulclub at Plan B, Hamerstraat 22, Amsterdam. Opening Friday 3 November 4-21h. The Rainbow Soulclub is a collective of individuals that operates from the Blaka Watra walk-in centre of the Amsterdam-based Regenboog Groep, or Rainbow Group. * The Rainbow Soulclub was founded in 2005 by the artists Saskia Janssen and George Korsmit, who with the Rainbow Soulclub orchestrate weekly encounters and collaborations between artists, art students and Blaka Watra’s clients. Over the last 12 years these encounters have spawned a whole diversity of activities: painting, writing, publishing, drawing, pottery, recording music, making costumes, launching campaigns, staging exhibitions, and even travelling to Ghana and Suriname. Under the title Rearrangement of Priorities, the Rainbow Soulclub is serving up its latest cocktail of politics, painting, poetry and coconuts for you.